Powers/Abilities: Its brain a repository of decades worth of cultural, warfaring, and scientific knowledge, the Bi-Beast is a brilliant tactician and inventor. It has constructed vast cities capable of flight or surviving under the ocean's depth, and it has utilized mind-control equipment to turn humans to its control. In addition, the Bi-Beast is vastly super-strong (Class 100), capable of trading blows with the Hulk without sustaining damage. (Incredible Hulk II#169 (fb) - BTS) - Bi-Beast was created by the Bird People, meant to be a repository for their accumulated wisdom if they should perish. With two skulls, one on top of the other, one containing cultural wisdom and the other knowledge of warfare, Bi-Beast was not taught science. Sky Island's machines began dying and Bi-Beast did not know how to fix them. Watching the monitors, he saw a winged woman (Harpy carrying the Hulk) on Earth and desired her companionship. (Incredible Hulk II#169) - Bi-Beast used Sky Island's technology to create a whirlwind, whisking Harpy and Hulk up to him. Within seconds, both guests had attacked Bi-Beast; Harpy was knocked unconscious and imprisoned, and Hulk changed into Bruce Banner. When Bi-Beast learned Banner was a scientist, they showed him Sky Island's machines. Banner agreed to work on them, and Bi-Beast sedated Harpy. Questioning each other, Bi-Beast was shocked to see MODOK suddenly arrive on the island, and MODOK caused Bi-Beast to question Banner's intentions. Bi-Beast rushed to confront Banner, who'd created a device to cure Harpy of her gamma-irradiated form. Banner then changed back to the Hulk and knocked Bi-Beast aside. MODOK then teleported a group of AIM agents on to the island and Bi-Beast, determined not to let Sky Island fall into anyone else's hands, triggered a self-destruct device despite being shot down by AIM. Bi-Beast then passed on just before Sky Island exploded. (Incredible Hulk II#215 (fb)) - The second Bi-Beast, containing the scientific knowledge that the other lacked, spent decades absorbing the knowledge of the Bird People. When the first Bi-Beast was destroyed, his conscious memories transferred to the second Bi-Beast, who awoke and fled to Earth in a capsule. The capsule remained at the bottom of the sea, waiting to be discovered. (Incredible Hulk II#212) - Bi-Beast's capsule gave off gamma radiation, leading SHIELD to it. They hired Sidney Levine to excavate it, and Nick Fury instructed Levine to turn the capsule over to Gamma Base to find out what was in it. (Incredible Hulk II#213) - Aboard the S.H.I.E.L.D. Helicarrier, Levine, “Thunderbolt” Ross, Clay Quartermain, and Benson struggled to open the capsule, then took a break. As they left the room, the capsule opened. 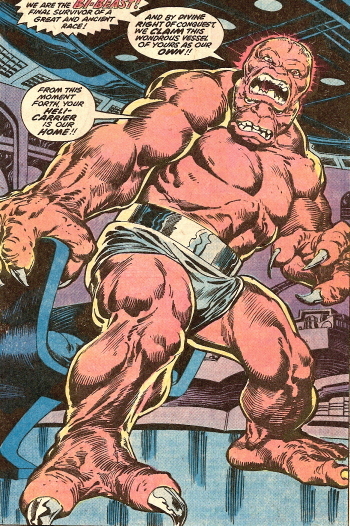 (Incredible Hulk II#214) - While Levine, Ross, and Quartermain searched for him, the Bi-Beast began reprogramming the Helicarrier, determined to make the ship his new home. (Incredible Hulk II#215) - Barricading themselves into the Helicarrier's master control room, the Bi-Beast revealed themselves to Ross, Quartermain, and Levine, explaining their origins and revealing their plans to destroy Earth as Earth had destroyed Sky Island. He demonstrated his power by turning some of SHIELD's own weaponry against them. In an attempt to lure the Bi-Beast out into the open, Ross summoned the Hulk aboard the Helicarrier to attack the Bi-Beast. Bi-Beast turned lasers on to Hulk before they could be attacked. (Incredible Hulk II#216) - Hulk almost succumbed to the lasers, but Ross activated a panel that allowed the Hulk to escape through the floor. Bi-Beast activated the Helicarrier's Omni-Launch Sequence, a process that would doom the Earth, but the agents and Hulk managed to shut it down with seconds to spare. Bi-Beast donned a battle-vest and attacked directly, tossing a machine at Levine, who was barely saved by Quartermain. Hulk and Bi-Beast battled through the ship until they reached small planes that Bi-Beast planned to escape on, but Hulk tore up the runway. Hulk and Bi-Beast went falling from the ship, and disappeared into the clouds. (Thor I#315 (fb)) - Bi-Beast washed up on an island. (Thor I#316 (fb)) - Bi-Beast allied with the evolved wolf, Man-Beast, and they traded skills; Man-Beast received Bi-Beast's knowledge, and Bi-Beast absorbed Man-Beast's extreme hate. Man-Beast worked with Bi-Beast over the following several weeks, though he stayed in the shadows. (Thor I#315) - Bi-Beast began capturing ships, forcing the ships' operatives to serve them and build them a giant submersible ship. They then used their scientific knowledge to build a new domed city, capturing large ships to use as the materials for its construction. With new computer systems, Bi-Beast brainwashed many humans into becoming his work drones. (Thor I#315) - Bi-Beast captured a new ship among whose occupants was Donald Blake (the secret identity of Thor). While the ships' men were brainwashed, Bi-Beast made final preparations on the city, soon ready to be launched into the sky. Despite some arguing among themselves, the Bi-Beast agreed to let Blake's mind remain free, convinced that his skills as a doctor would come in handy for the other slaves. Blake soon turned into Thor and attacked Bi-Beast just as the city began hovering. Thor managed to damage the equipment as they traded blows, and Bi-Beast ordered his slaves to attack Thor with him. However, Thor was able to destroy the mind-control equipment and the men joined him in destroying the city's machinery. Bi-Beast turned offensive weaponry on the humans below the floating city just before Thor savagely attacked, knocking Bi-Beast out. The city soon landed. (Thor I#316) - Despite being held in restraints, Bi-Beast broke free when Man-Beast lowered an offensive weapon for his aid. Bi-Beast turned this weapon on the hero Iron Man (Tony Stark) who'd stood nearby. They fought until Bi-Beast was pulled aboard his ally's ship and whisked away. The ship crash-landed and Bi-Beast and Man-Beast argued over the next course of action, but Man-Beast asserted his will, sending Bi-Beast to retrieve tools. Bi-Beast killed an alligator in the swamp and tossed Man-Thing to the side when the muck-monster stood in their way. He forced several local humans, including Billie-Sue, to gather their vehicles and return with him to Man-Beast. When Iron Man and Thor attacked, the two villains battled them, Bi-Beast delivering punches and power-blasts, until they were both defeated by the heroes. (Quasar#14) - After being held captive on the Stranger's ship-world for months, Bi-Beast was among the captives freed by Over-Mind to fight against the Stranger. (Quasar#16) - Bi-Beast and several others joined forces to stop the Stranger, and fought alongside the Squadron Supreme (Doctor Spectrum (Joe Ledger), Lady Lark, Power Princess) (who were being mind-controlled by Over-Mind) against Stranger, Quasar, Hyperion, and Makkari. When Power Princess was freed from the control, she attacked Bi-Beast. The battle was declared finished when the Watchers intervened. Bi-Beast lay unconscious under the giant Monitor. (Incredible Hulk II#412) - Still a captive of the Stranger, the Bi-Beast, who seemingly developed more emotions (including love and hate), grabbed an unguarded talisman, the Family Jewels, and used them to teleport to Earth, immediately seeking revenge on the Hulk. He knocked out Leonard Samson and attacked Hulk, but one head was distracted and smitten with She-Hulk while the other was not. From afar, the Stranger set the Family Jewels to explode and kill millions, and wondered if Bi-Beast or Hulk would notice. Hulk was waylaid when he tried to grab the Jewels. The heads continued to argue over She-Hulk's attractiveness, and Hulk informed Bi-Beast that the Family Jewels were set to explode. Not believing Hulk, the smitten head agreed to give the Jewels to the suddenly interested She-Hulk. The Jewels were knocked aside and picked up by a small child, Timmy, and stuffed inside his stuffed cat. Bi-Beast grabbed the cat, but then was punched through a building by Hulk and She-Hulk and knocked unconscious. 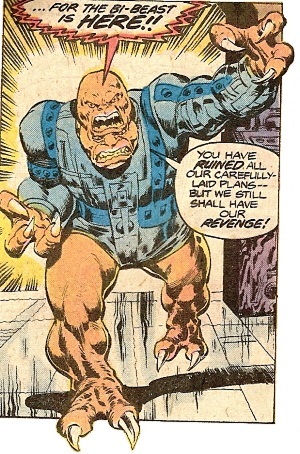 (Savage Hulk I#1) – Bi-Beast was part of a large group of villains that attacked the Hulk at court in New York City. (Nova III#7) - As Nova desperately argued with Red Raven to end the Avians'invasion of New York, the Bi-Beast interceded and threatened to destroy him. However, Red Raven, having seen the error of his ways, told the Bi-Beast to stand down, and they returned, along with the other Avians, to the Sky Island. (Defenders II#6 (fb) - BTS) - Red Raven revived and organized his people into building a new Sky Island. (Defenders II#5) - Bi-Beast was shocked when four Defenders appeared suddenly on Sky Island. (Defenders II#6) - Bi-Beast tried to greet the Defenders, but Hulk attacked and the two traded blows until Hulk was knocked over the side of Sky Island. Hulk returned and resumed the battle until Red Raven and Dania appeared, ordering Bi-Beast to stop, and Dr. Strange held Hulk back with a spell. Hulk was soon freed again and temporarily resumed his battle with Bi-Beast once again. (Thing II#8 (fb)) - Bi-Beast attacked the Thing in Central Park and was bragging about how he had twice the brains and twice the vision. Nearby hero Squirrel Girl noted that Bi-Beast also had two noses, but only two arms. She had her squirrel friends gather all the nearby garbage and place it around Bi-Beast. When he plugged both his noses and no longer had hands free, the Thing punched Bi-Beast into unconsciousness. (Beyond!#1 (fb) - BTS) - As part of a cosmic experiment, Bi-Beast was summoned by the Stranger and told to do battle on a foreign world. He was seemingly killed in the battle, and later buried by Deathlok (Michael Collins). (Incredible Hulks II#630) – A massive battle broke out between Hulk, Red She-Hulk, A-Bomb, She-Hulk, Amadeus Cho, Monica Rappaccini, and an underground monster in Las Vegas. An errant wish was cast from a powerful wishing well and several of Hulk’s old foes magically showed up in response, including Bi-Beast, Wendigo, Fin Fang Foom, Arm’Cheddon, and Umar. (Incredible Hulks II#631) – As the villains struggled to make sense of what was happening, they realized they had a common hatred of the Hulk. Bi-Beast and the others attacked Cho and Rappaccini, but Hulk rushed to their rescue, accidently dousing the villains in well water. For his wish, Bi-Beast wished a huge section of Vegas to become the new Sky Island, and a large piece of land went floating into the sky. Cho tried to convince him to let the civilians go, but Wendigo’s wish was to have people to eat. When the Hulk wished “for a real fight”, Bi-Beast and Wendigo were turned into giant-size, and they proceeded to attack. As Cho magically evacuated the city, Hulk attacked the giants, wrapping Wendigo’s tails in Bi-Beast’s mouth and forcing Bi-Beast to bite down. As the villains started fighting each other, the Hulk launched them into the air and returned the floating island to the ground. The two soon crashed into Arm'Cheddon’s floating ship. (Incredible Hulk II#634) – In another’s wishing, Bi-Beast, Arm'Cheddon, and Wendigo were held in chains until Hulk released them to join his army of monsters in attacking Tyrannus’ forces. They were soon all seemingly killed when the world was destroyed. They were revived by Umar, and they learned that their wish to wipe the Hulk from the face of the Earth had been granted as Hulk was now trapped in the Dark Dimension. (Secret Avengers I#29) - Bi-Beast joined the Masters of Evil alongside hundreds of members in Bagalia. They attacked John Steele on behalf of Max Fury; Steele later died. (Secret Avengers II#2) - Bi-Beast was among the villains of Bagalia who battled the Secret Avengers, who sought to free Taskmaster. (Superior Foes of Spider-Man#12) - Believing that Chameleon and his aid Sergei had stolen a valuable painting from him, Owl formed the Sinister Sixteen to retrieve it. They stormed the Chameleon's headquarters, battling mummies, an alien, giant lizards, sharks, and spiders, and armed men. (Superior Foes of Spider-Man#13) - When the police arrived most members of the Sinister Sixteen including Bi-Beast surrendered. (Avengers Standoff: Assault on Pleasant Hill Omega#1) - Bi-Beast was contained in the Pleasant Hill prison by SHIELD, his identity rewritten by Kobik, the sentient Cosmic Cube, until he was liberated. (Captain America: Sam Wilson#7) - Bi-Beast caused some destruction on the streets of Pleasant Hill. (Avengers Standoff: Assault on Pleasant Hill Omega#1) - The Avengers, Winter Soldier, and Avengers Unity Squad stormed Pleasant Hill, fighting the liberated villains and apprehending many of them. During the fight, Bi-Beast battled Ms. Marvel (Kamala Kahn). Comments: Created by Roy Thomas, Herb Trimpe, and Jack Abel. There were two Bi-Beasts. The first died in his first appearance in Incredible Hulk II#169 and the second in Beyond!#1. Bi-Beast has entries in the Official Handbook of the Marvel Universe Master Edition#21 and Hulk 2004. In regards to the original Bi-Beast's weight -- only 1,000 pounds when it's 20 feet tall -- it seemed like something that large would easily weigh at least 10 times that; but the more I thought of it, I realized that it's living on the Sky Island -- that much weight would probably have destabilized the hovering island if the Bi-Beast was simply just walking around, so its creators probably constructed it from super-light materials, or maybe it had some kind of internal mechanism to neutralize its weight, so that it wouldn't cause any calamities from its movements. Thanks to Graham Weaver for help with the Nova issue.